Welcome to Cheat Sheet, our breakdown-style reviews of festival films, VR previews, and other special-event releases. This review comes from the 2019 SXSW Interactive Festival. It has been updated to coincide with the film’s theatrical release. When Jordan Peele’s directorial debut Get Out hit screens in 2017, it was a revelation. Peele was known as an incisive comedian from his racially frank, wide-ranging sketch show Key and Peele, but nothing in his history suggested he had such a talent for crafting mesmerizing horror stories. Get Out is a startling, frightening film, but it’s also meticulously crafted to make the audience politically and socially uncomfortable, with a candid, unflinching message about how black and white Americans interact, and an allegorical underpinning designed to make viewers of any race squirm with discomfort — while still laughing at the ironic humor in Peele’s script. Peele has been hugely in demand ever since — he’s been tied to a vast slate of films and TV shows, including producing the Tracy Morgan comedy The Last O.G., the YouTube series Weird City, and the fast-approaching Twilight Zone reboot. But the new feature film Us is his first solo writing-directing project since Get Out. And it’s being met with vocal anticipation and nervous hope, as his fans wonder whether Get Out was an unrepeatable one-off flash of genius, or just the first salvo in a long line of memorable movies to come. Us suggests that both of those things might be true — the new movie isn’t as unconventional as Get Out, or crafted with the same kind of watchmaker’s attention to how every tiny gear fits together. But it’s striking and unsettling, the kind of horror movie designed to make audiences walk away feeling leery about ordinary things around them, from shadows at night to mirrors to rabbits to scissors. Opening on a shot of a television in 1986, helpfully framed by shelved VHS copies of highly relevant horror movies like C.H.U.D. and A Nightmare on Elm Street, Us initially takes place in two timelines. In 1986, as the Hands Across America benefit is being staged, a young girl (Madison Curry) visits a Santa Cruz beach boardwalk and confronts an eerie apparition that looks just like her. As an adult, Adelaide Wilson (Lupita Nyong’o) remembers this encounter with a heavy sense of dread, and when her husband Gabe (Winston Duke, M’Baku from Black Panther) books a vacation that takes her back to the same beach, she starts experiencing frightening flashbacks. 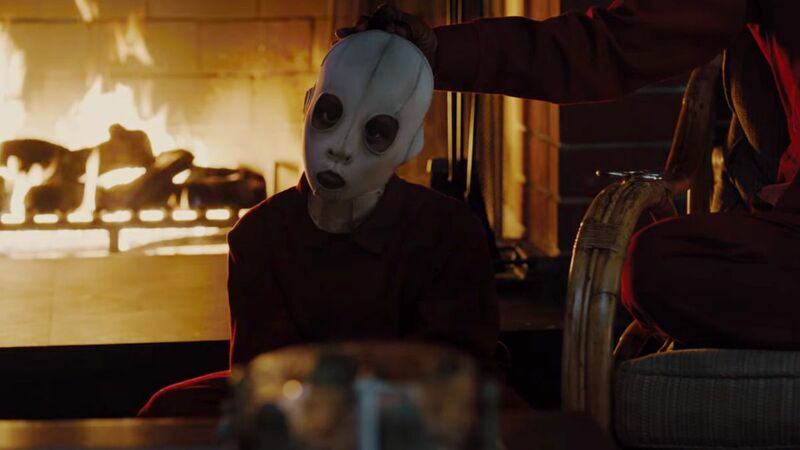 Soon, eerie dopplegängers of Adelaide, Gabe, and their children Zora (Shahadi Wright Joseph) and Jason (Evan Alex) appear, wearing red jumpsuits and wielding brightly colored, hellishly sharp shears. Everything that falls out from there — what the doubles are, where they come from, and what they want— comes as a series of shocks better experienced than described. But while that metaphor plays out in the most literal way, as Adelaide and her family face warped mirror images of themselves, another strong metaphor emerges from the story: a message about wealth inequity, and how easy it is to be unaware of privilege and comfort, while other people are suffering and hungry. Adelaide and her family — and their friends, the Tyler family (Elisabeth Moss, Tim Heidecker, and twins Cali and Noelle Sheldon) — live in comparative luxury, and have the freedom to fixate on trivia like whether Jacob can get a magic trick to work, or whether Gabe’s tiny new boat is big enough for the whole family. They’re oblivious to the depths of the suffering going on not far away, among people who are remarkably similar to them, apart from the circumstances of how they came into the world. It’s a hell of a heady experience while it’s running, but it leaves behind a lot of baffling questions. Compared to Get Out, Us feels like more conventional modern horror. It follows a familiar storytelling pattern — initial scare, a drop back to calm and familiar scenes that set up the characters, a series of foreshadowing events and fake-out scares, a sudden escalation of tension. The leadup sometimes feels frustratingly slow and repetitive, especially when the audience isn’t really learning anything new about the characters, apart from the fact that Gabe is oblivious to Adelaide’s past trauma, and that Zora and Jacob don’t particularly get along. And the transition into real horror is so abrupt, it’s almost comical — until it isn’t. Fans of modern horror will find a lot of familiar ground in Us once the dopplegängers appear. Their initial entrance into the Wilsons’ lives echoes home-invasion thrillers like The Strangers, and the later stalking sequences resemble It Follows in their particular combination of lurking, inevitable terror, and abrupt violence. Us also echoes It Follows in that familiar horror-movie feeling of characters trying to adjust to the new rules of their reality, and figuring out how to exploit them. (Though an early claim that minor but startling coincidences herald the doubles’ arrival doesn’t seem to come to much.) And as the story unfolds, it picks up some resonance with M. Night Shyamalan’s The Happening, though without the tone of extreme self-importance and ridiculous that made that movie so laughable. Part of what made Get Out so memorable was the way it echoed a recognizable reality — the discomfort the lead character experiences when he’s away from his friends and the people who really get him, the friction that can arise in a racially mixed group, even when both sides are supposedly well-meaning, even the simple embarrassments of trying to get along with a romantic partner’s irritating family, for the sake of the relationship. There’s a lot less recognizable territory in Us, which instead mines tension from the extreme unrecognizability of the situation. The characters are faced with something they don’t understand and don’t know how to fight, and the more the story unfolds, the weirder and wilder it gets, with Peele keeping the reveals coming up to the film’s final moments. The ending seems likely to kick off a lot of frustrated debate — at the SXSW Q&A, Peele said, “My favorite thing is the idea that people will leave ready to have a conversation, with whoever they’re with.” And that certainly seems likely. But the movie’s biggest strength comes from the cast’s stunning eeriness in playing their own dopplegängers. As “Red,” Adelaide’s double, Nyong’o is staggeringly creepy. She gives Red a voice that sounds like a rock-record backmasking accident, and an overall affect of a collection of primal elements glued into the shape of a human, and making a game effort to play at being one. Duke plays Gabe as an affable dork, trying to jolly his family along with lame dad jokes and an upbeat affect, but he turns his own double, “Abraham,” into a wordless, baffled beast, suffering and dangerous at the same time. And the kids are similarly creepy, but Shahadi Wright Joseph may be the film’s unheralded MVP — as Zora, she’s sullen and phone-addicted, a kid just testing the limits of adolescence and her ability to resist her parents by finding them annoying. As her own double, she’s a frighteningly perfect specter with an unwavering smile — seemingly a rebuke to the irritating phenomenon of strangers telling women they’d be prettier if they smiled more, most recently seen in the pettiest backlash against Captain Marvel. Joseph doesn’t show her teeth when she smiles, but Us certainly does — everything about its creepy approach to seemingly-normal-things-being-horribly-abnormal comes out in that fixed, unwavering grin. Peele directs Us with a masterful collection of horror-movie tricks — jump scares that actually pay off, a cat-and-mouse game in an isolated place filled with bright lights and deep pools of impenetrable shadow, a throat-closing Michael Abels score full of intense drumming and choral chanting that elevates the action to operatic levels of drama. But his greatest asset is the performances, which turn an already creepy premise into something endlessly inhuman and unnerving. His stated intention is to get people thinking about their own capabilities for harm, and their own culpabilities in what goes on in America. The capabilities Nyong’o and her castmates show in stepping outside of familiar humanity, and dragging an audience along with them into an unrecognizable place, make a strong argument that we don’t always know what we’re capable of, or what horrors we might contain. There’s plenty of blood, but the violence isn’t all that graphic. A PG-13 makes sense, with the understanding that younger and older viewers may have trouble sleeping afterward. How can I actually watch it? Us is in wide release in American theaters as of Friday, March 22nd, 2019.